Many daddy patterns are somewhat delicate and easily damaged, be it by fish, or even prolonged casting, and general ware and tare. 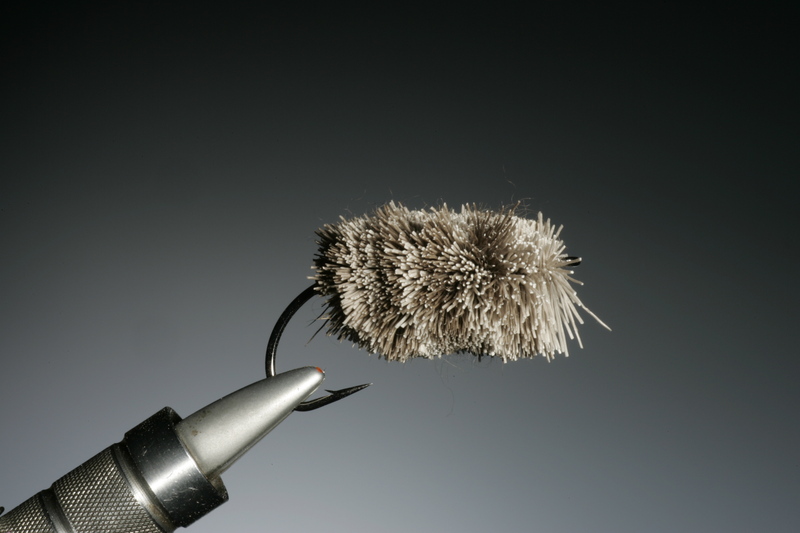 Here’s a pattern that show you how to make your daddy’s not only more resillient, but also with added float ability. Tipulidae or Daddy long legs as they are more commonly known, are a familiar sight both on and off the water more or less the whole summer. There are in fact several hundred species of daddy’s from just a couple of mm to over 40mm long. Although most species of daddy are terrestrial there are a few that are aquatic. Daddy’s are remarkably poor fliers and once airbourne are largely at the mercy of the wind and where it takes them, being forced to crash land on the water, blowing across the waters surface surface like tumble weed. Trailing their legs behind them, in some cases even making a bow wave as they blow and skate across the surface. 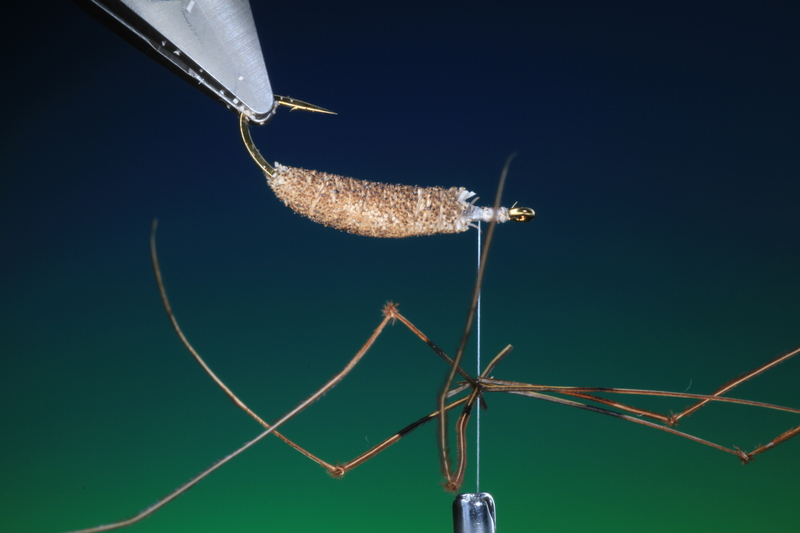 The extended body method that is illustrated here is a good way of creating suitable sized bodies that can also represent other larger bodied insects such as dragon flies, mayflies and of course daddy long legs, without using larger hooks, that will in turn introduce more weight, which is inaapropriate for patterns that are intended to float. As for the deer hair make sure that it is the best spinning hair from the winter coat. 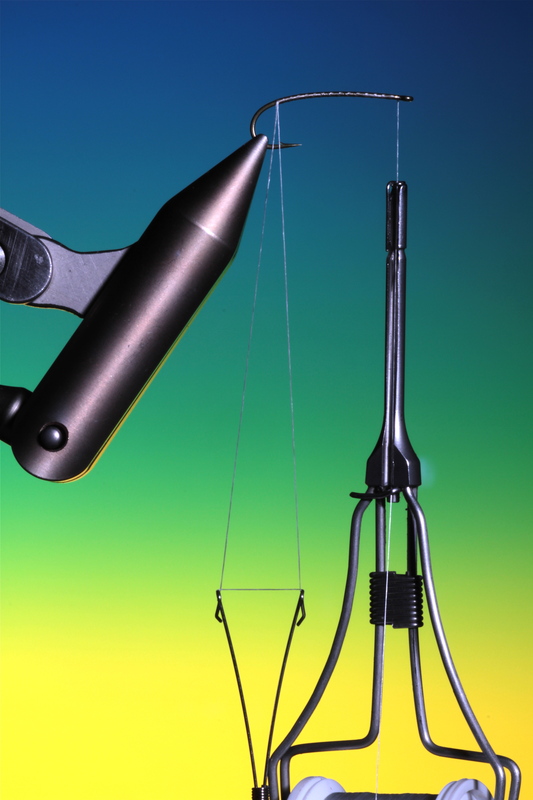 Dont just try the natural colours for the bodies of daddy’s try bright attractor colours such as bright green and yellow, these will make the difference when there are lots of daddy’s on the water and add an attractor element. 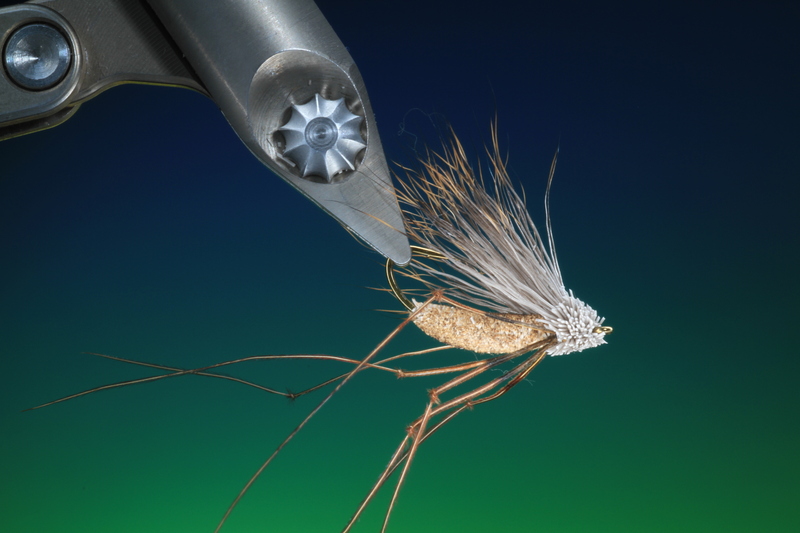 Secure your curved nymph / terrestrial hook in the vice. Cover the hook shank with tying thread a little down into the bend. At the tail of the fly make a dubbing loop. 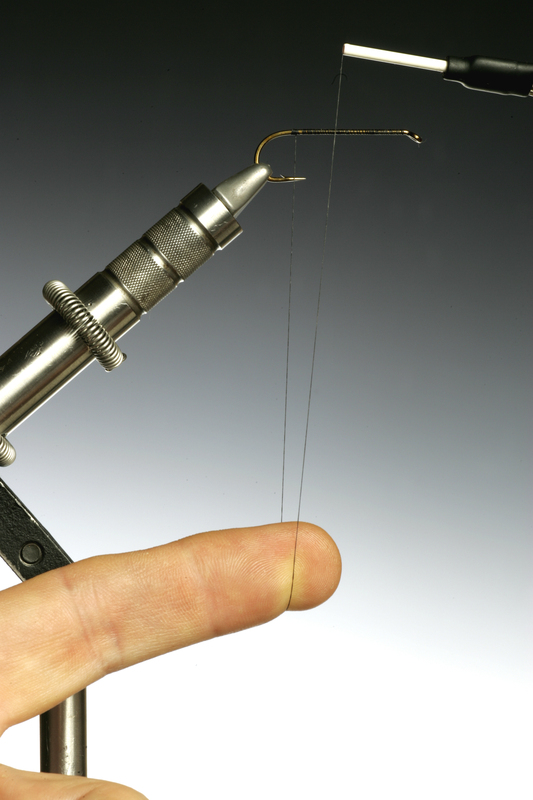 Its important that you make this loop with doubling your tying thread and not splitting it. 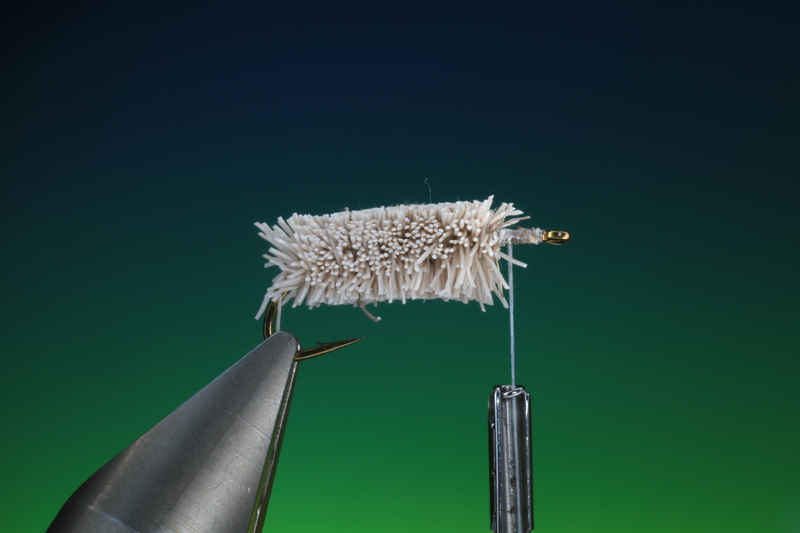 The deer hair is quite dense and needs the strength of a double loop to spin it correctly! 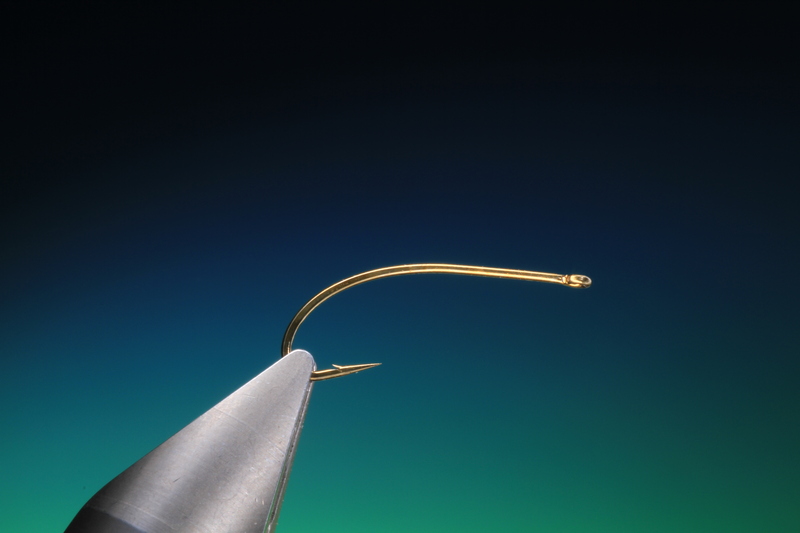 Wrap your tying thread out of the way behind the hook eye. 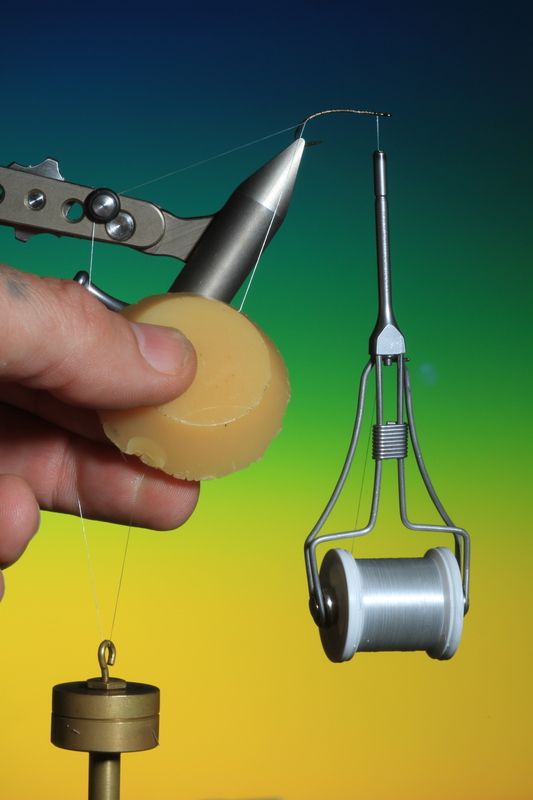 If you are using Dyneema or another gel spun thread, you will need to wax it. This will give better purchase on the deer hair when spun. Place a length of deer hair, from the winter coat in a magic tool or a bull dog clip and cut off the hide. Place the hair in the dubbing loop. The deer hair should have at least 1 cm. through the loop on the cut side. 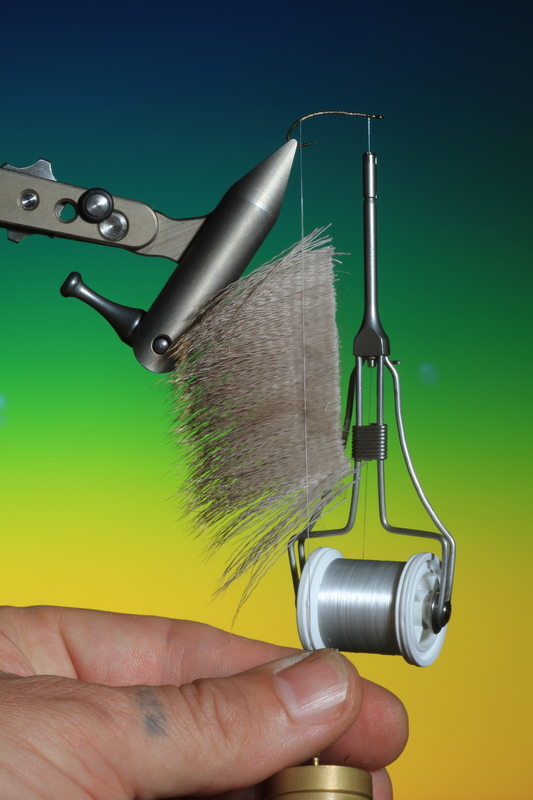 Spin your dubbing loop until the deer hair becomes an even dubbing brush. 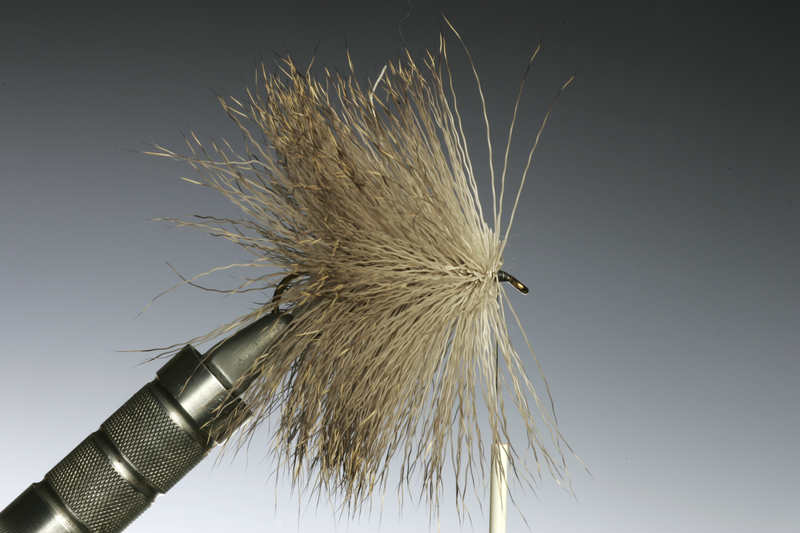 Wind on the deer hair brush as you would a regular hackle, making sure to brush the hair back with each turn. Tie off the dubbing loop about 1 cm. behind the hook eye. 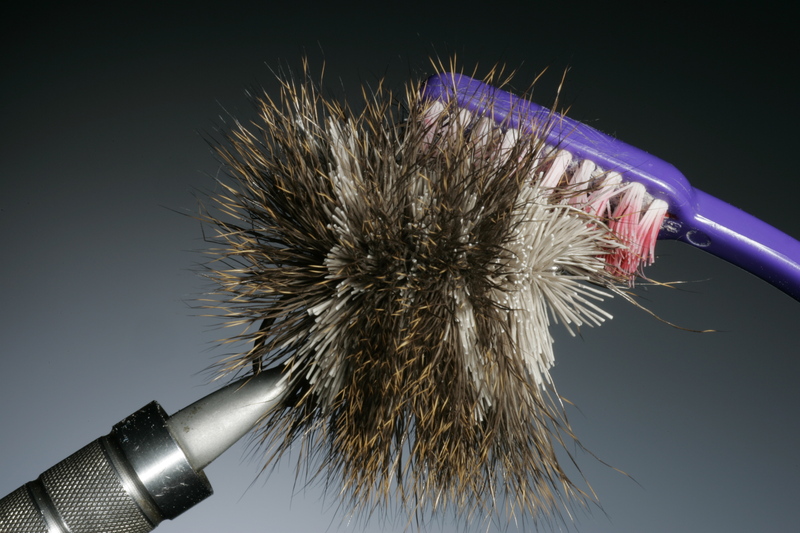 Before you start trimming the deer hair brush out and trapped hairs with a stiff tooth brush. Now make a few initial trimming cuts with the scissors too form the basic body shape. Trim the remaining body hair. With a pair of finer scissors trim the body to the required body shape. 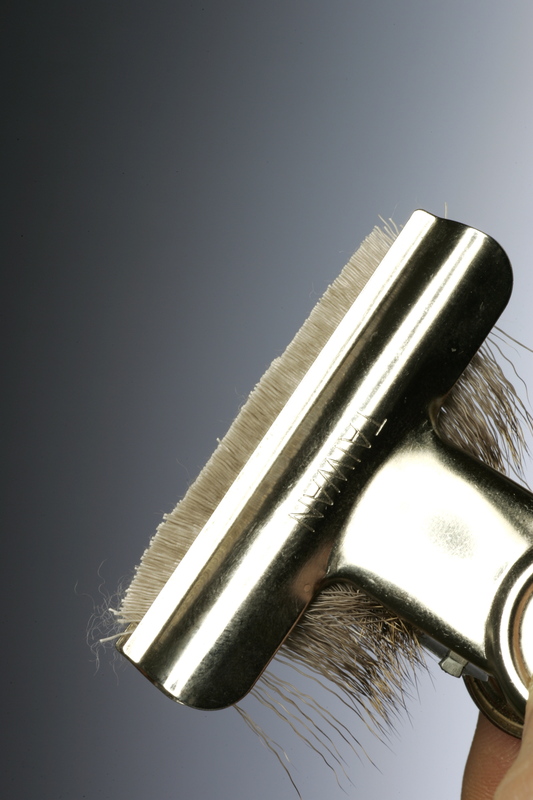 Now with a lighter singe the trimmed body, DO NOT BURN! 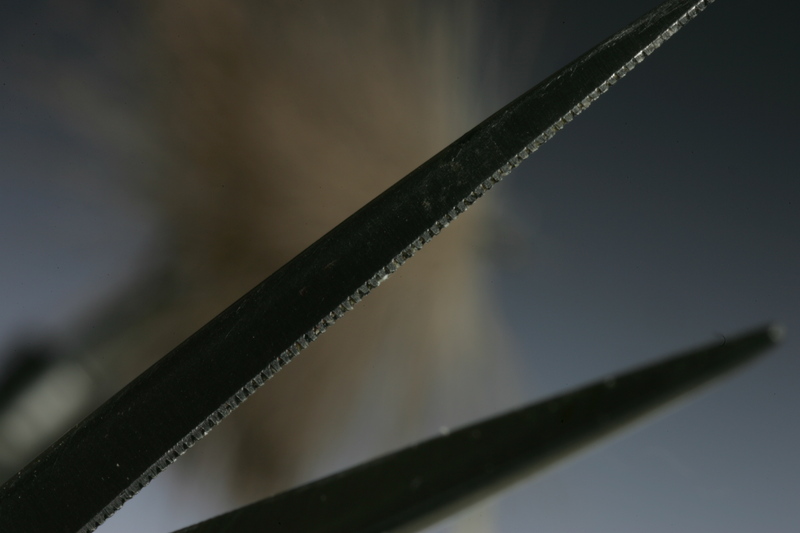 After singeing the clipped deer hair body will tighten and become very even. Turn your fly up side down in the vice. 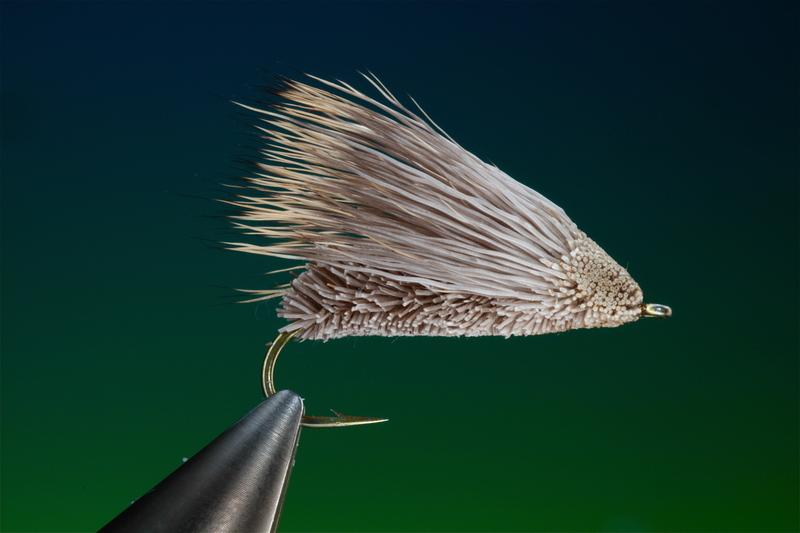 Tie the joints in six or seven pheasant tail fibers for the legs while still on the tail feather. 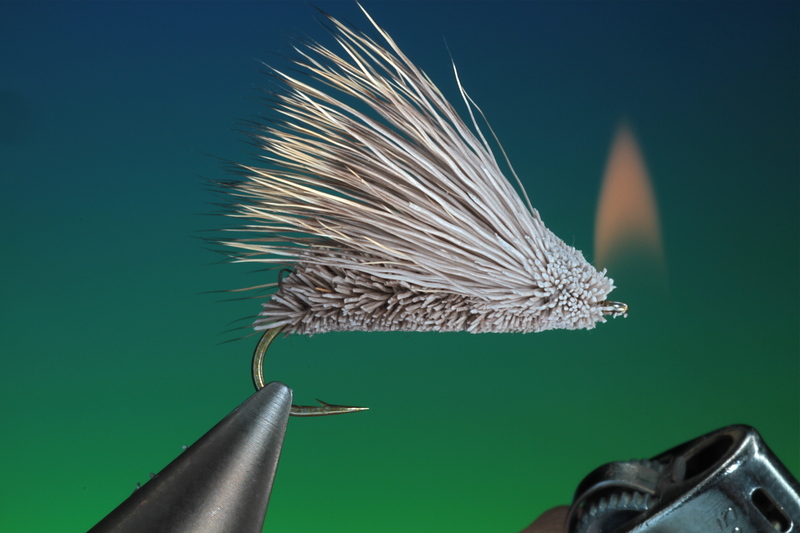 Place the finished legs in a magic clip and trim off the tail feather shaft. For this dubbing loop you need only split your thread. 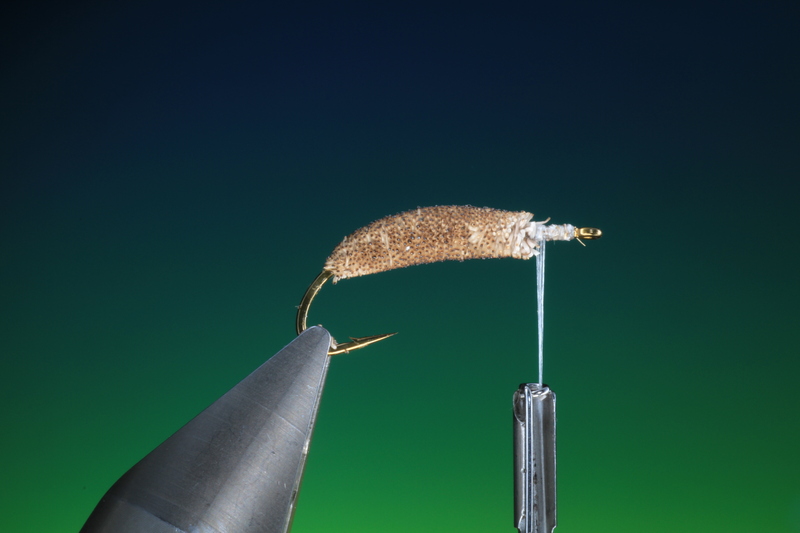 Place the pheasant tail legs in the loop and spin the bobbin. The legs will flare in all directions. Cut a medium bunch of deer hair and remove the underfur. 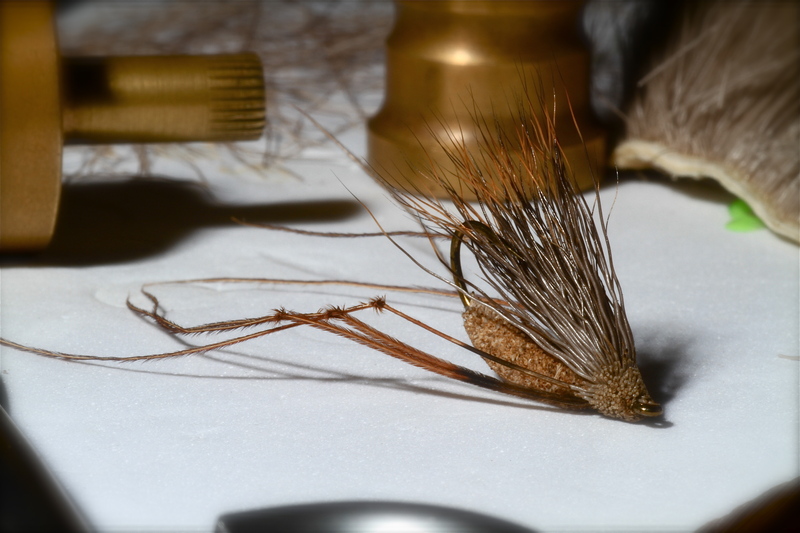 Stack the deer hair if wished in a hair stacker and tie in as a wing on top of the body as shown. 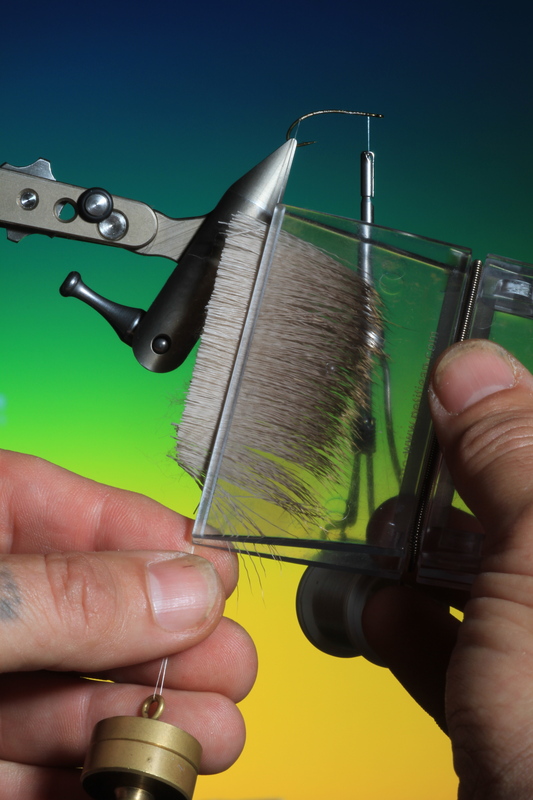 Its important that you use enough deer hair in the wing too little and the fly will not fish the correct way, so more is better. 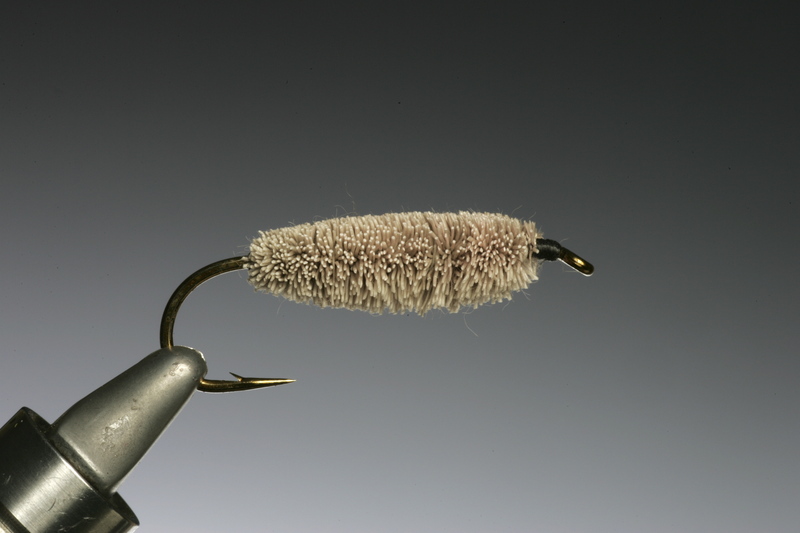 The buts of the deer hair will flare and form a muddler type head. Turn the fly the correct way again in the vice, whip finish and trim the underside of the muddler head, taking care not to remove too much wing. Once the head is trimmed you have your finished deer hair daddy. Taking care you can also singe the head of the fly as with the body. 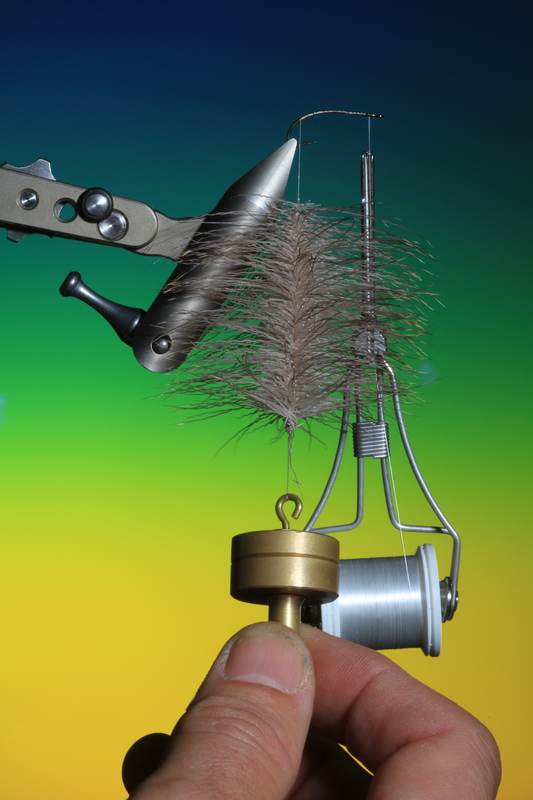 With a balanced wing and head this pattern will land up side down every time. 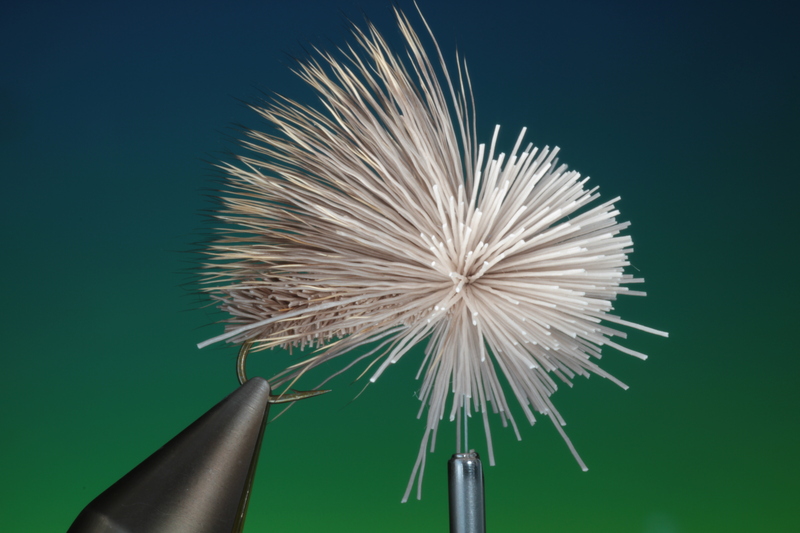 The fished deer hair daddy with a singed head. 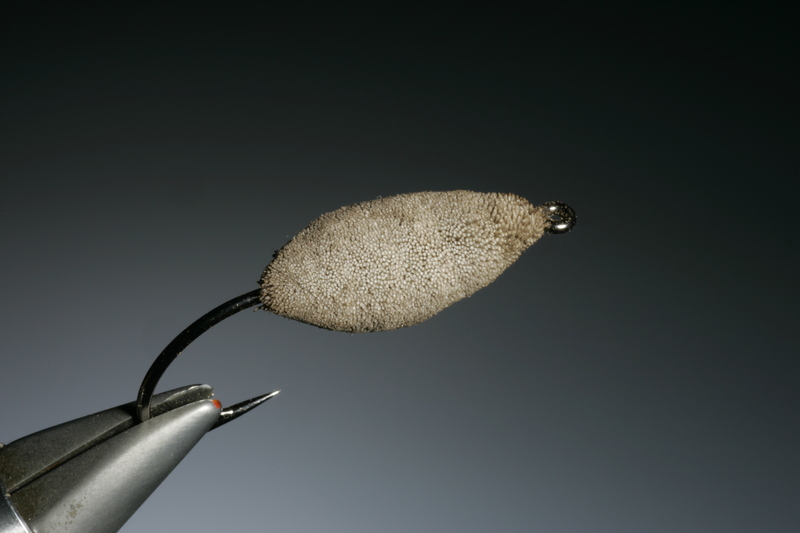 This pattern floats like a cork and can be stripped through the surface if wished like a muddler. Tying with deer hair part 3. 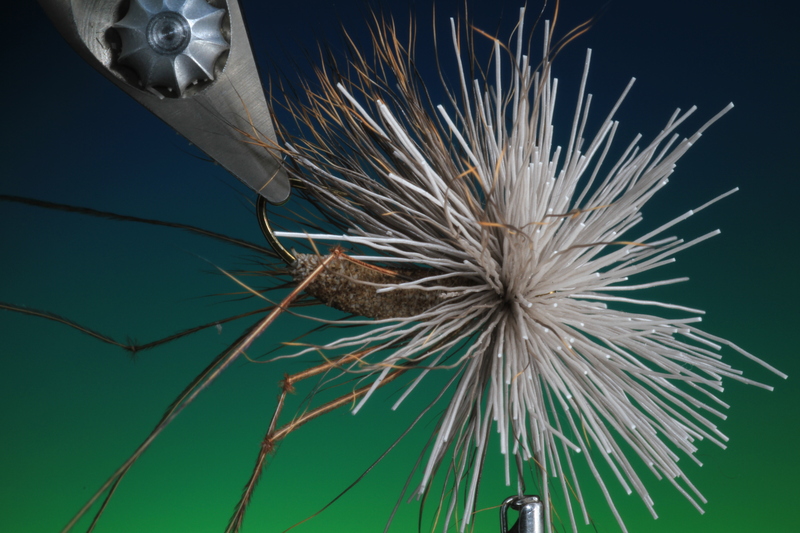 Spinning ultra tight bodies with deer hair. Here are a couple more quick techniques, for making cork like bodies from deer hair and a deer hair guard. If you would like a very tight spun body. 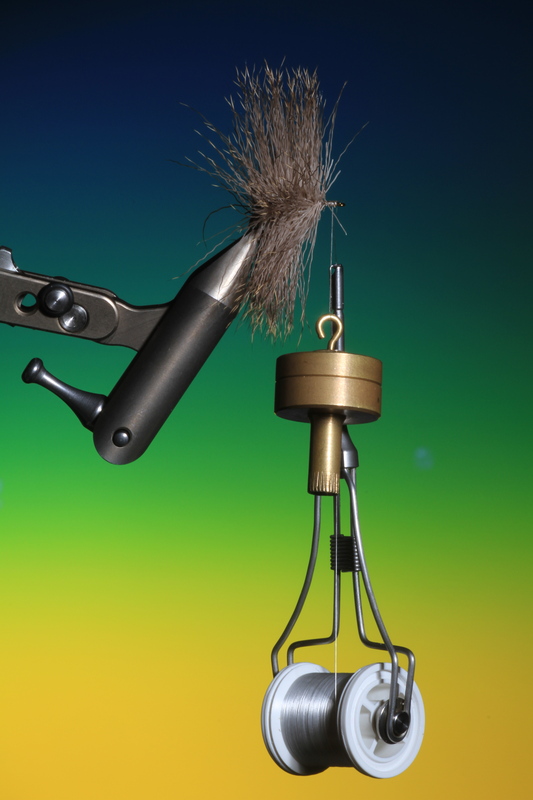 As you cover the hook shank with spun deer hair using a finger and thumb at the rear of the hair and at the front push and twist your right hand to pack the hair tight together. Repeat this after every bunch of hair is tied in. 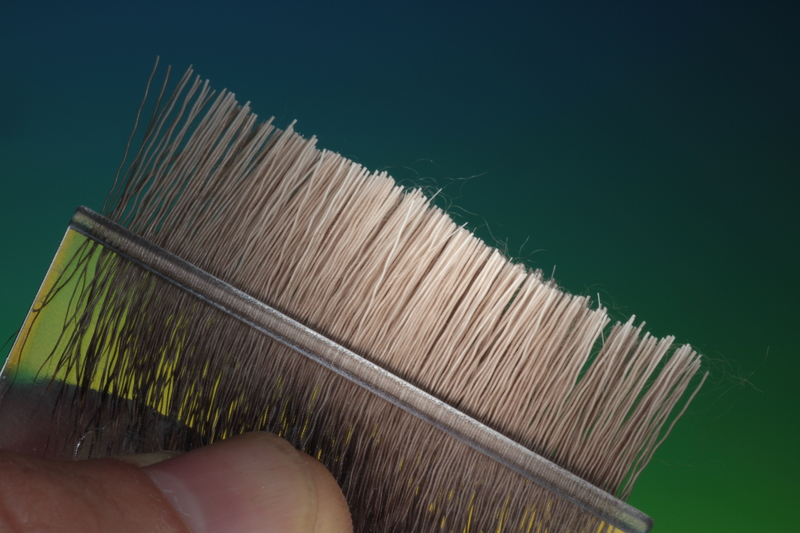 Once the body is finished brush out all the fibers with an old tooth brush before you start trimming. This is very important! Trim your body roughly to the correct size. You can be as detailed as you like at this stage. Now using a gas lighter, petrol lighters and candles give off too much soot. Carefully burn the surface of the hair body. Taking care not to set it on fire! The singeing of the hair will tighten the packing and cauterize the tips making it tight and even. 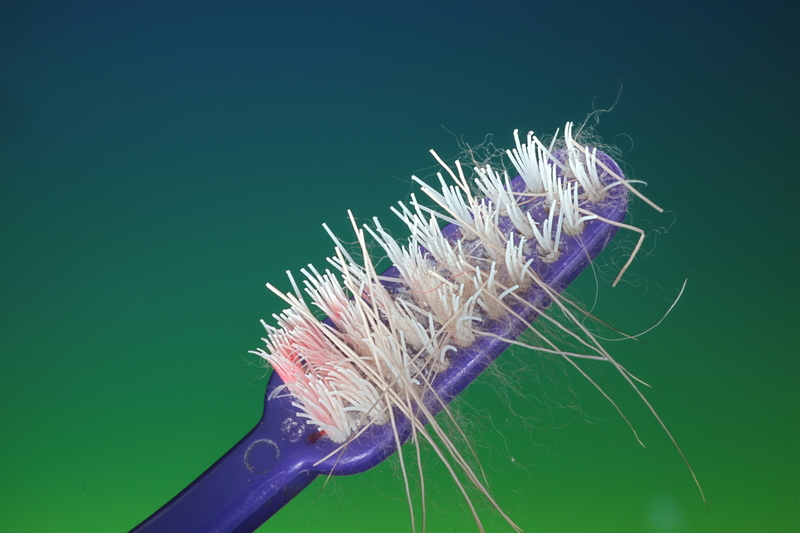 Brush off the soot with a tooth brush. 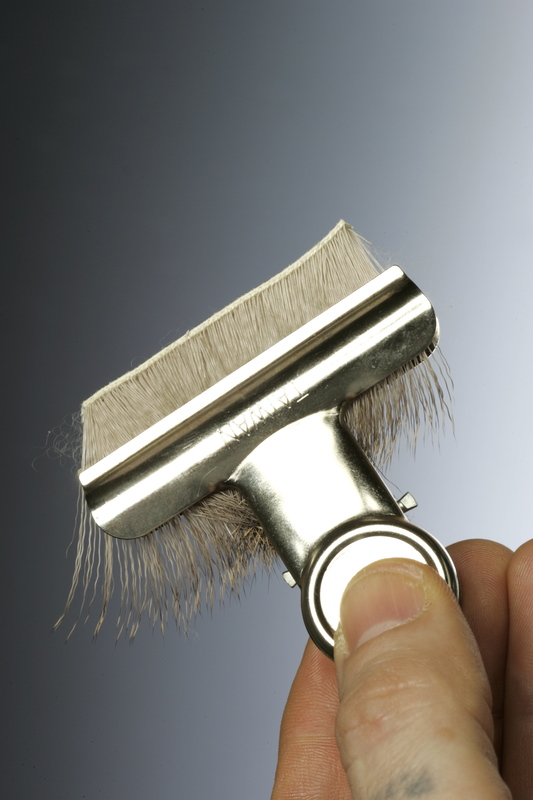 The result is an almost cork like body of perfect spun deer hair with a smooth even finish. That also floats like a cork! 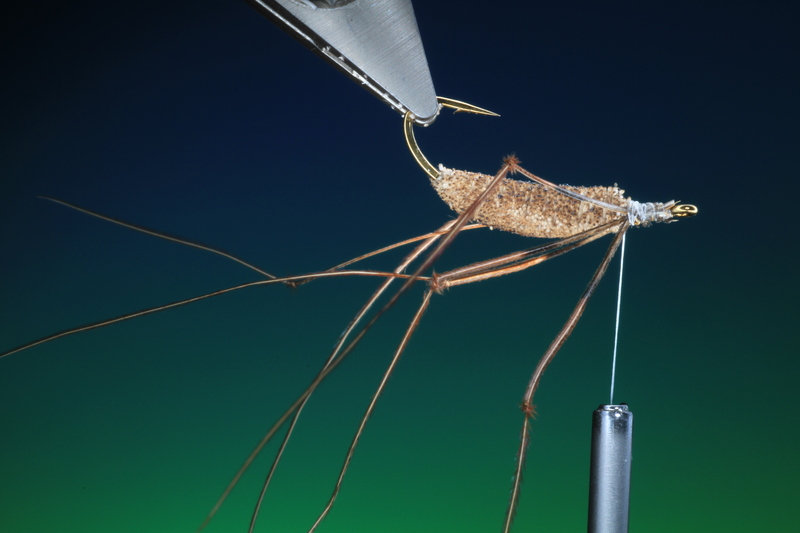 This is another trick for whip finishing large deer hair flies. 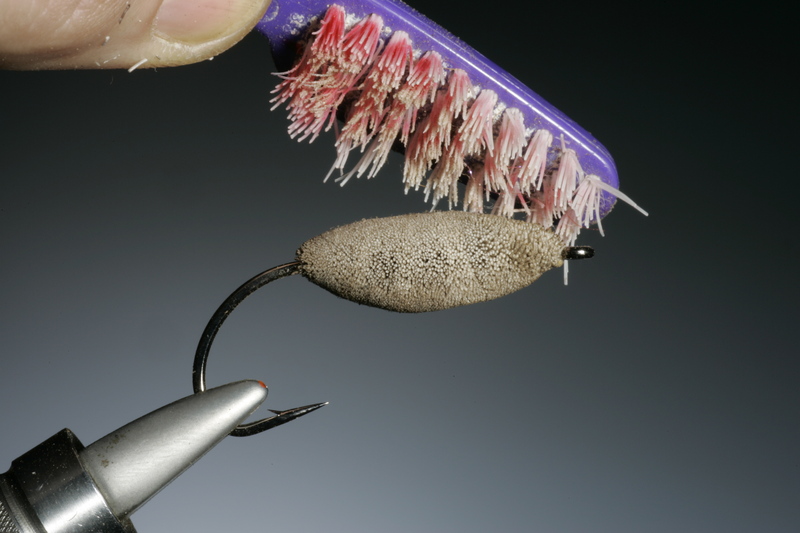 If you have problems getting in to the hook eye to whip finish, before starting tying cut the end off a rubber washing up glove and make a hole in the finger tip with a dubbing needle. Place the glove finger tip over the bobbin as shown. 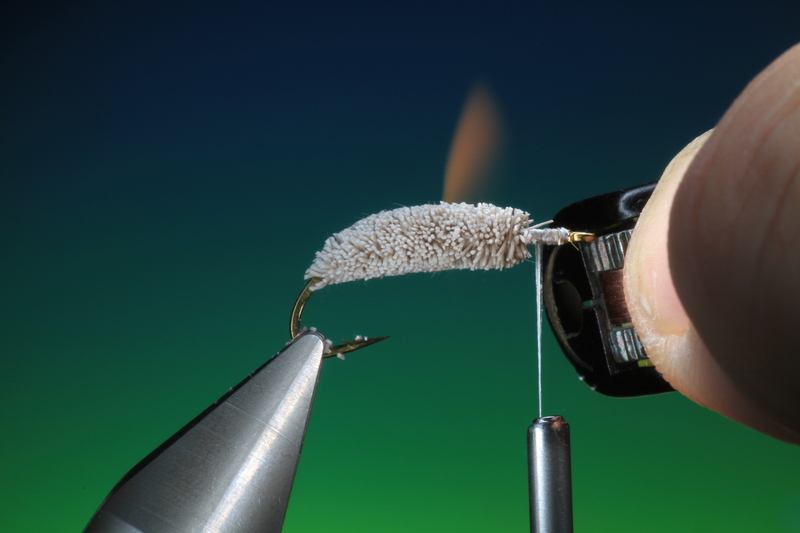 Once you have finished your fly the bobbin and finger tip are as shown. 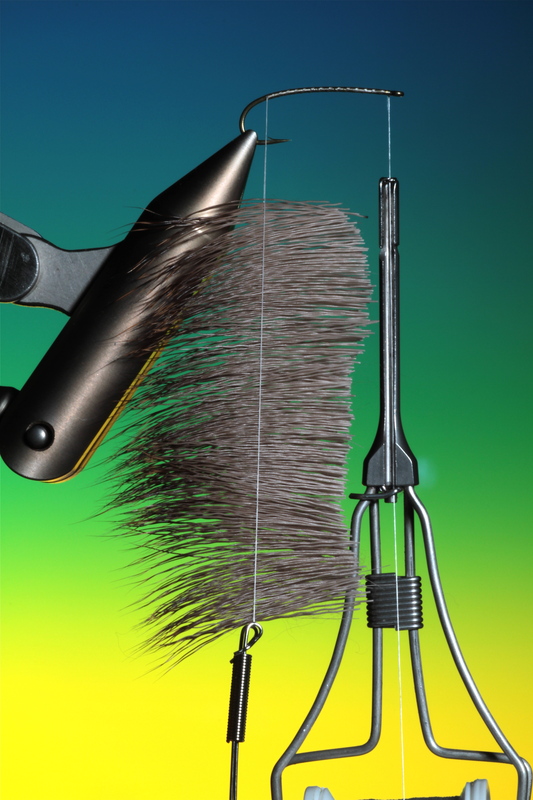 Now for a easy trouble free whip finish just slide the finger tip over the hook and deer hair. 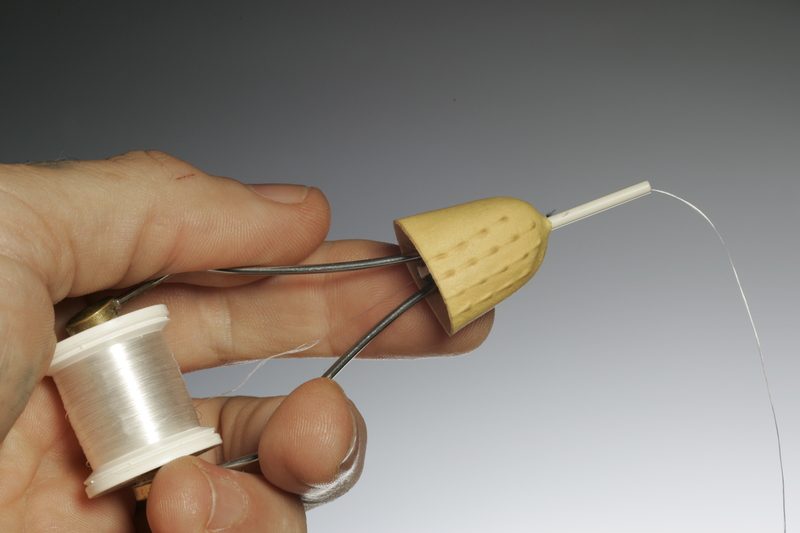 Remove the tip after you have whip finished and removed your tying thread. Techniques for tying with deer hair part 2 Spinning and burning. 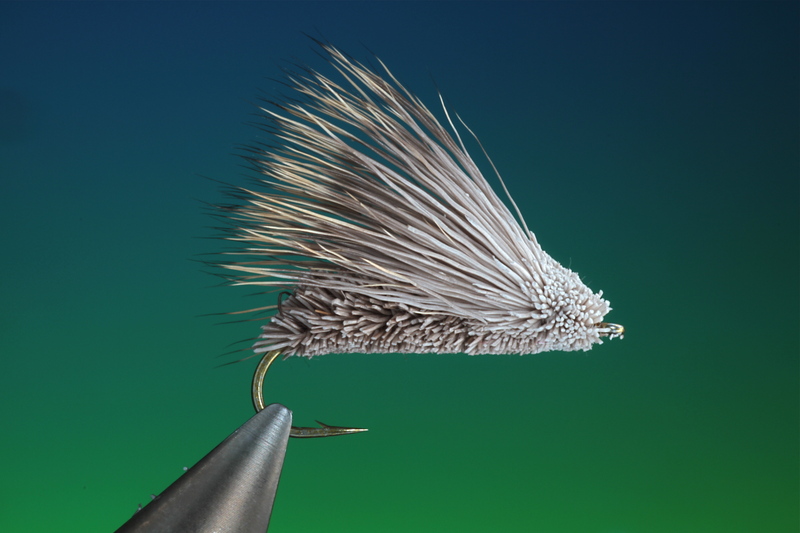 This is a hybrid pattern that combines two great patterns, the wing and head of the Swedish streaking caddis and the body of the British Goddards caddis. 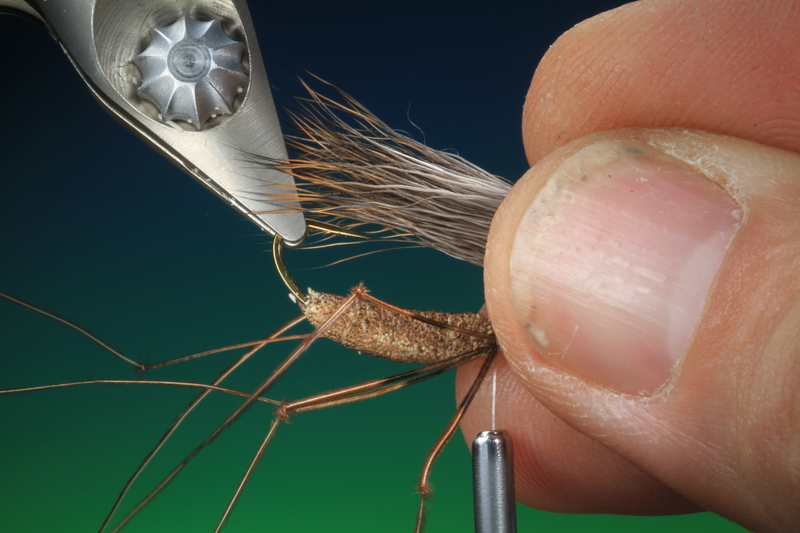 There are a few techniques here that are useful when tying with deer hair. Cut a thin strip of deer hair from a winter coat, rather like a deer hair zonker strip and attach a Magic tool clip about half way down the hair. With a pair long straight scissors trim off the hide from the deer hair strip. You will see that there is a little under fur left in the trimmed end! 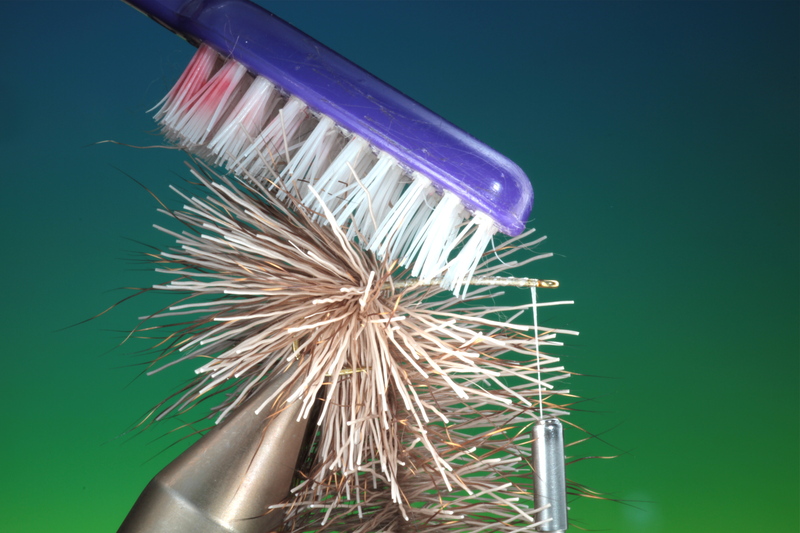 Using a tooth brush, brush out the loose hairs and under fur from the clip. Place a terrestrial hook in the vice. 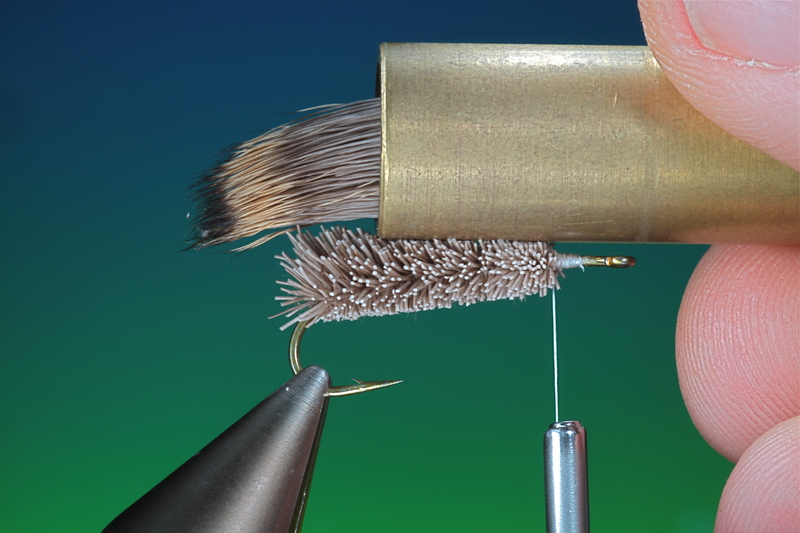 Cover the hook shaft with a foundation of tying thread. 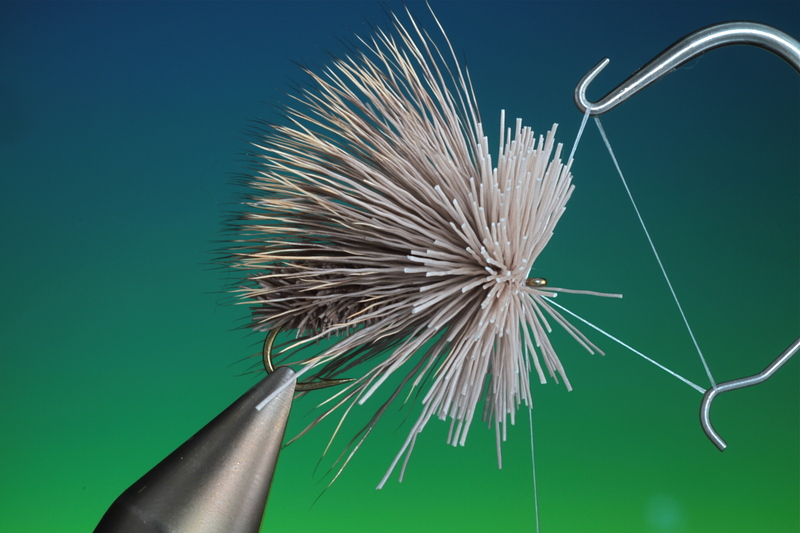 I use only Dyneema gel spun thread for tying with deer hair, if you haven’t tried it I recommend you do! 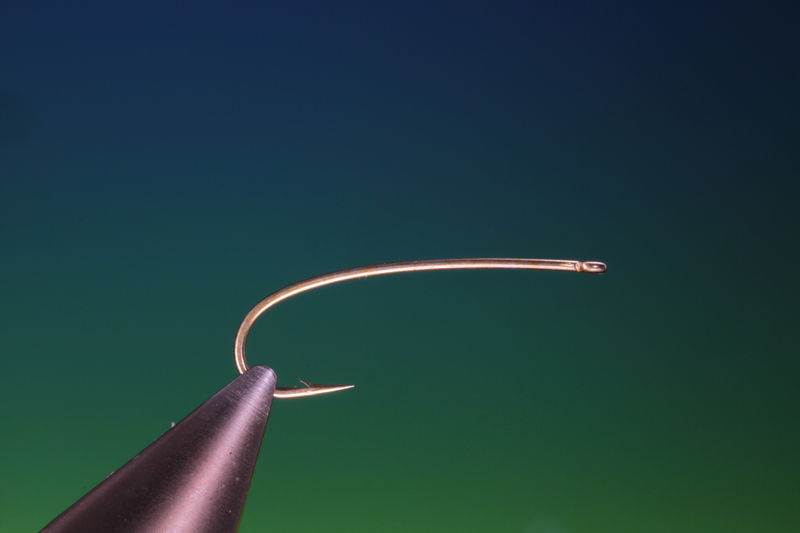 Make a dubbing loop at the rear of the hook, make sure that the two ends of the loop closest too the hook shank are touching each other! If they are not the loop will remain open and will not grip the deer hair. 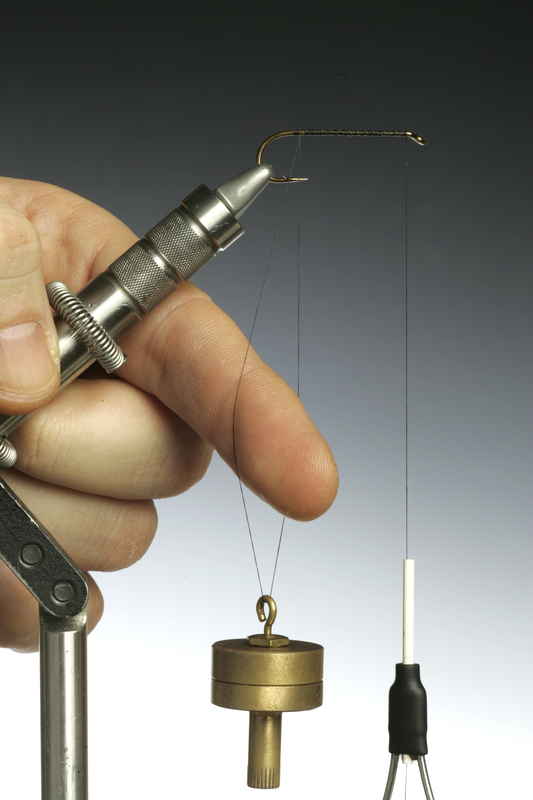 Wind your tying thread forward out of the way toward the hook eye. 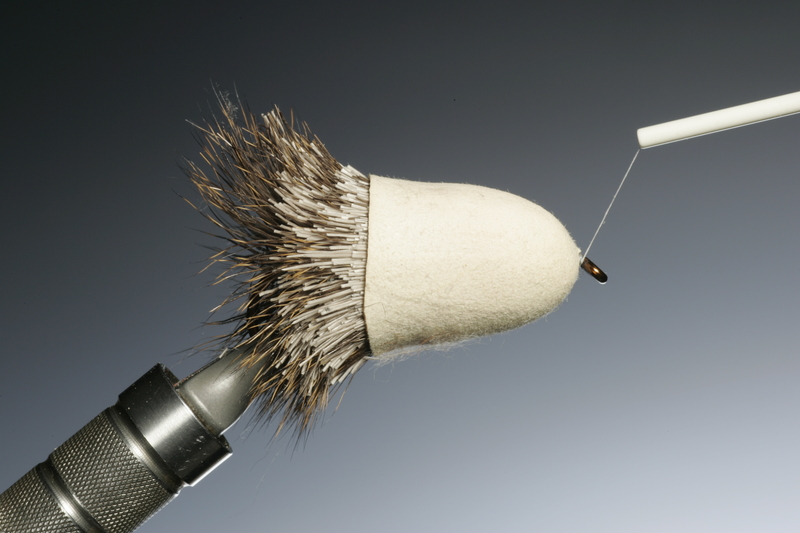 Un treated deer hair is quite fatty, If you wax your thread it has a much better purchase on the hair and reduces the chances of it slipping in the loop. 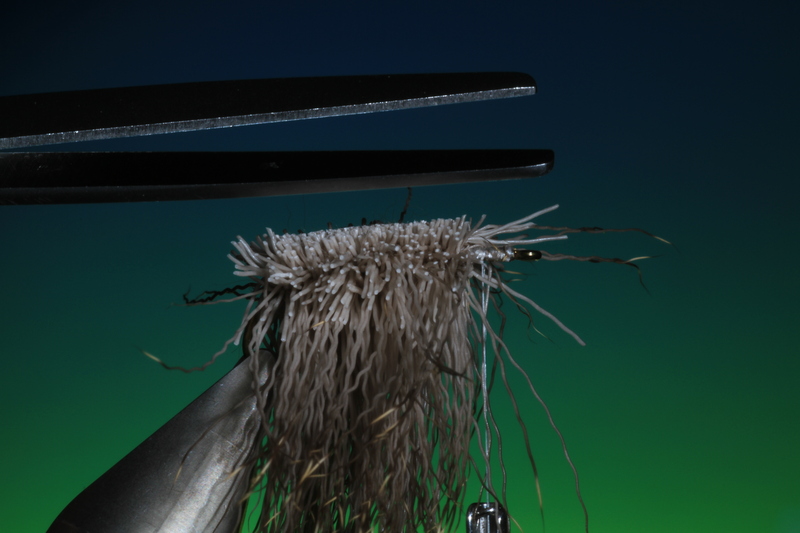 Place the loaded magic tool clip in the dubbing loop and trap the deer hair centrally in the loop. 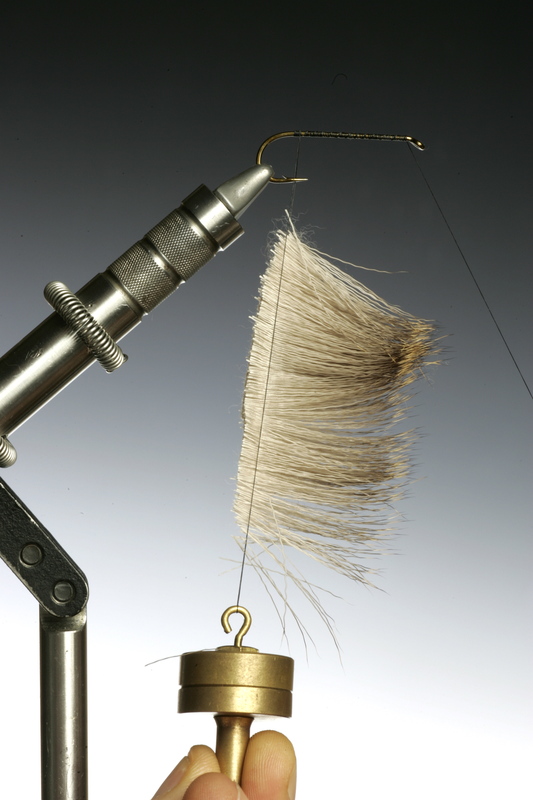 Start to spin your deer hair in the dubbing loop. 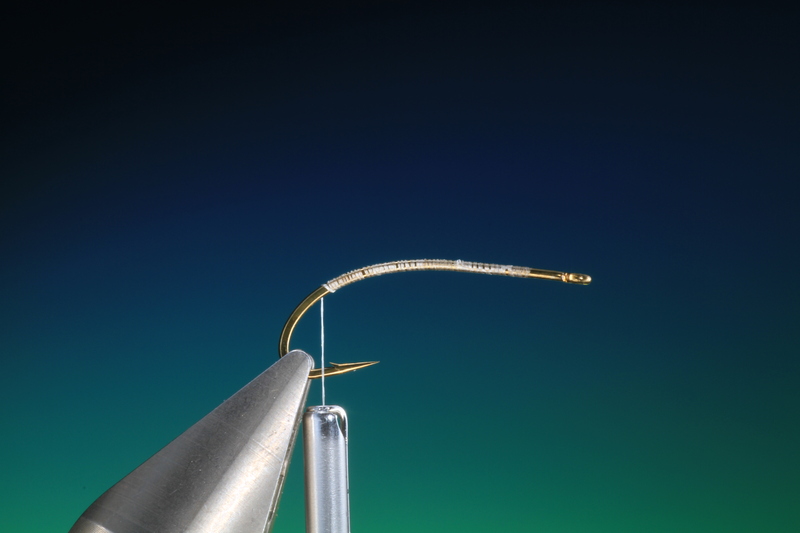 You can see in this image that the loop is not fully spun as you can still see the core of tying thread. 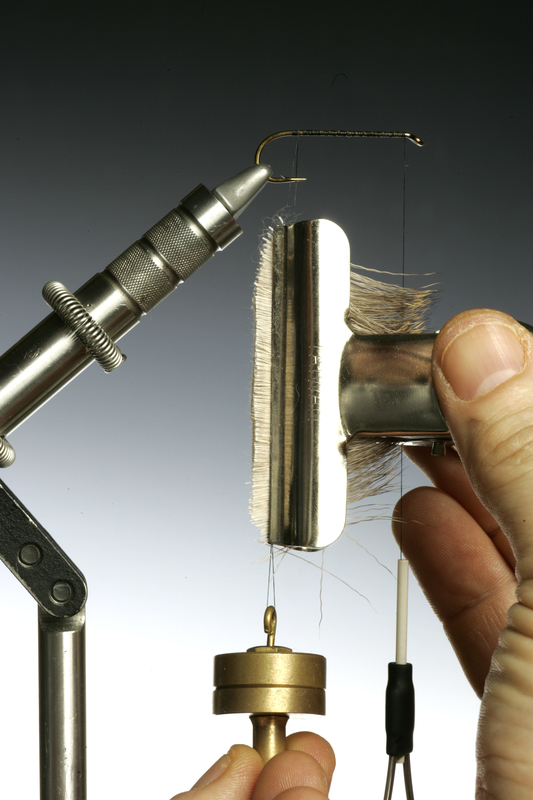 You must continue spinning the loop until the core is no longer visible and the hair is evenly spun. 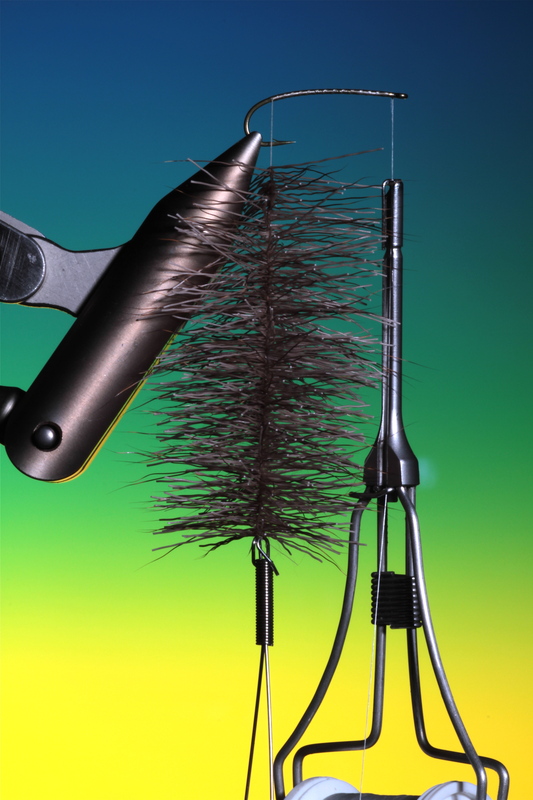 You can now start wrapping the deer hair dubbing brush as you would a traditional palmer hackle along the whole hook shank. 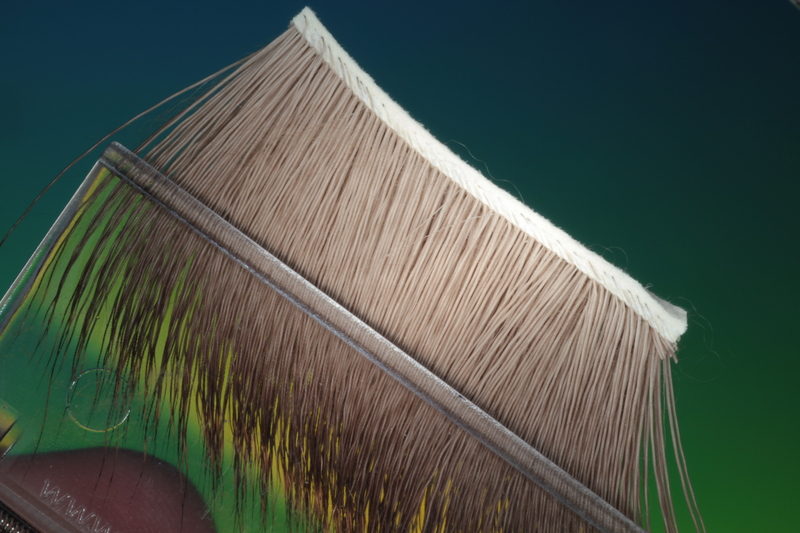 Make sure that you brush the deer hair fibers back with each turn so as not to trap them with the next turn! 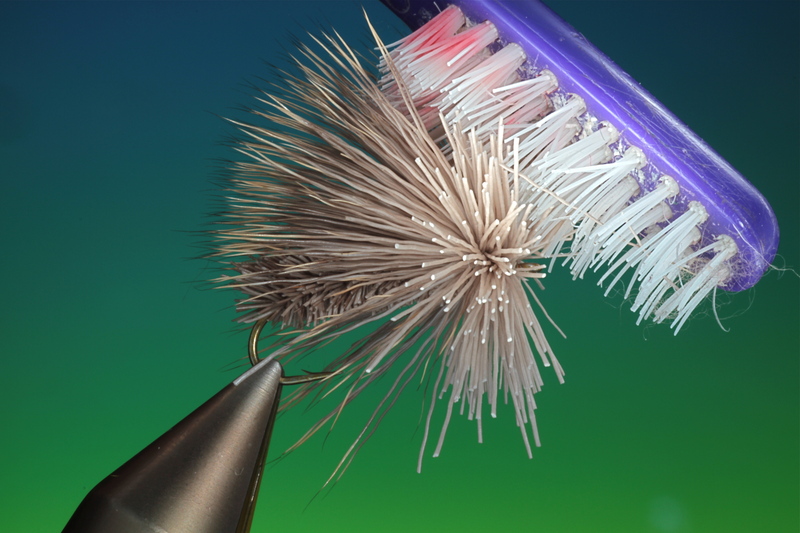 Once you have wound the whole dubbing brush tie it off and give it a good brushing with a tooth brush in every direction. 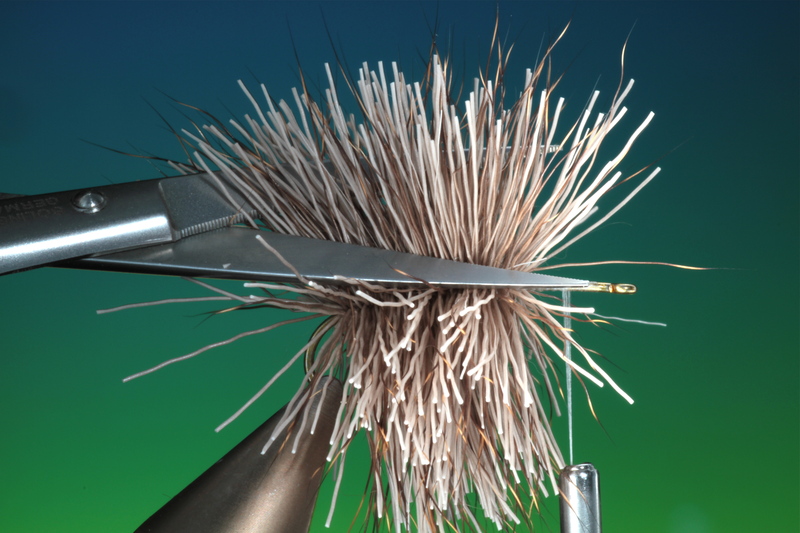 This will free any fibers the have become trapped and give a better result when trimmed. 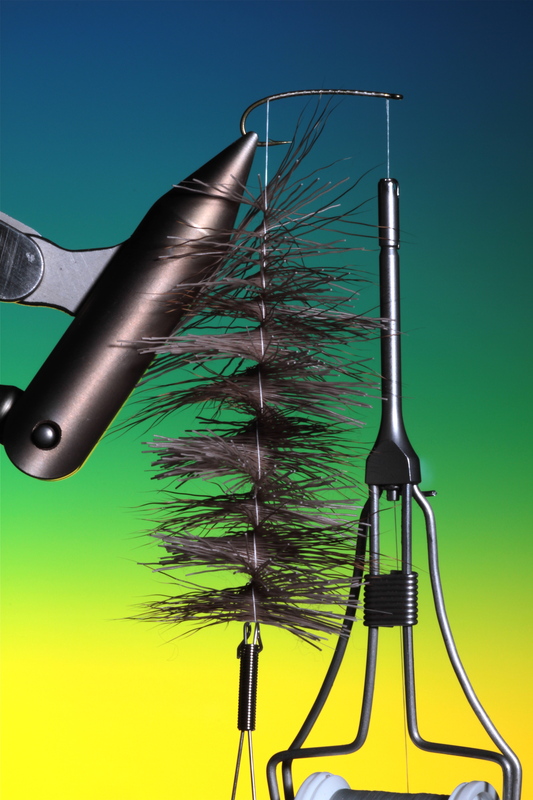 With a pair of serrated straight scissors trim the hair from the rear of the hook. 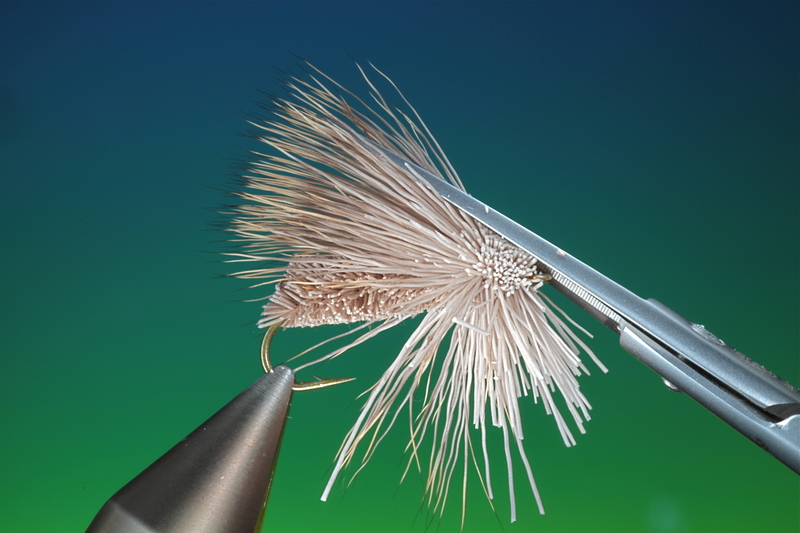 Once fully trimmed you should have a Goddard caddis type body. 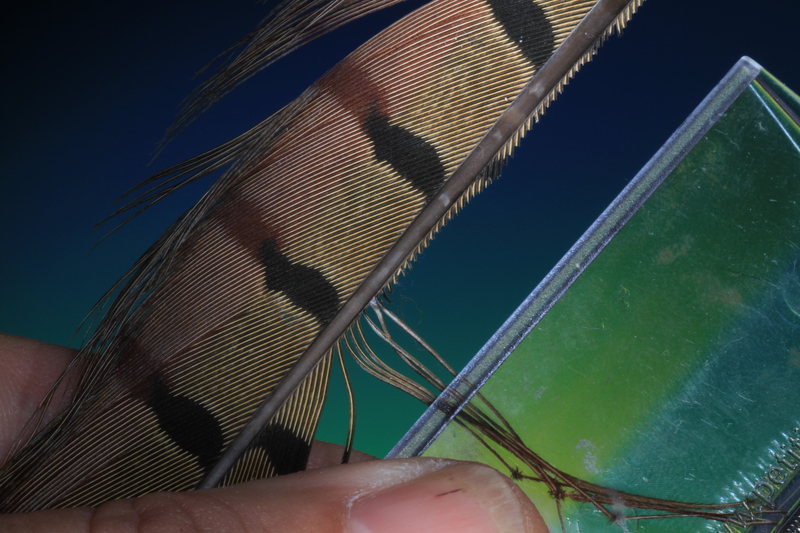 For the wing you will need a generous bunch of deer hair. Remove ALL the under fur, if you dont, the hair will not spin fully. Once cleaned stack the hair in a hair stacker. 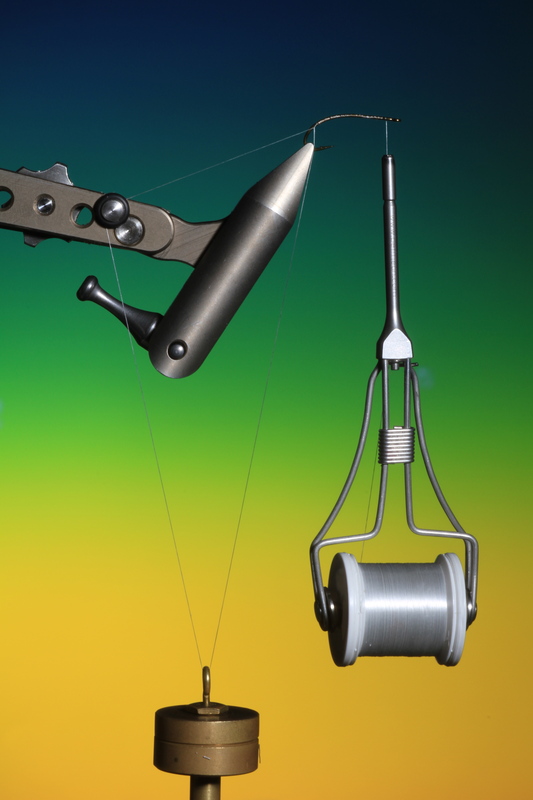 Measure the wing on the hook. 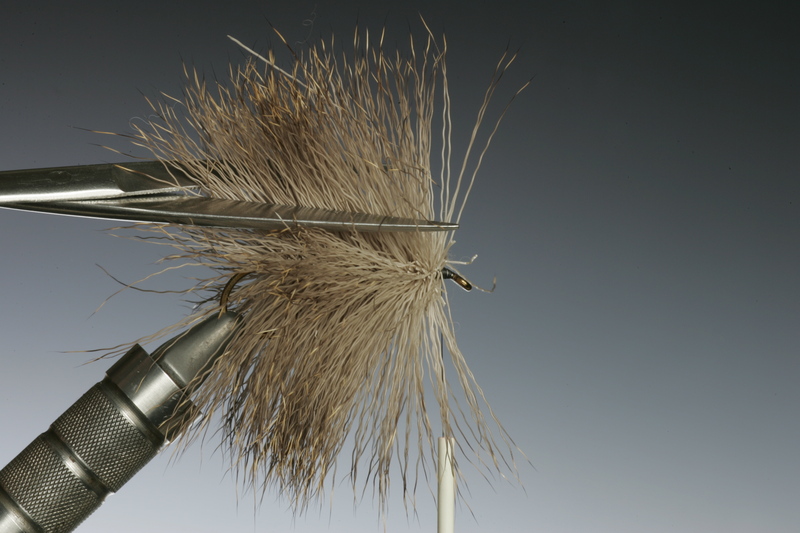 While holding the hair in place at the correct length on the body make two loose turns with tying thread around the bunch of deer hair and then tighten. 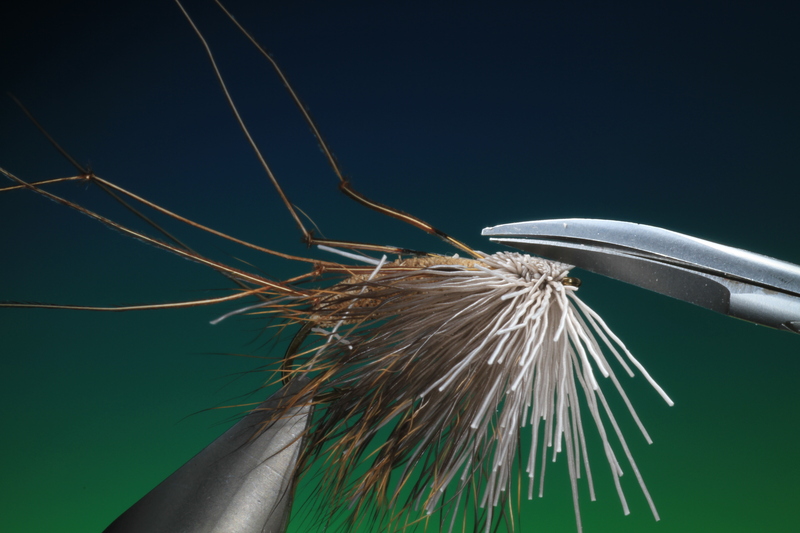 Make a few tight turns of tying thread through the remaining deer hair towards the hook eye to secure it and whip finish. 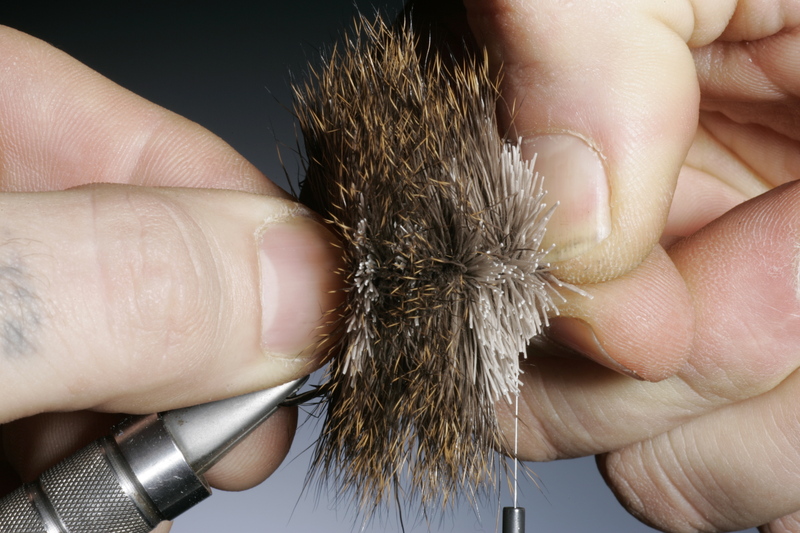 Remove your tying thread and once again give the flared deer har head a good brushing. Now, while resting your scissors on the hook eye trim the head all the way round. The under side of the head should be trimmed level with the body and cone shaped. 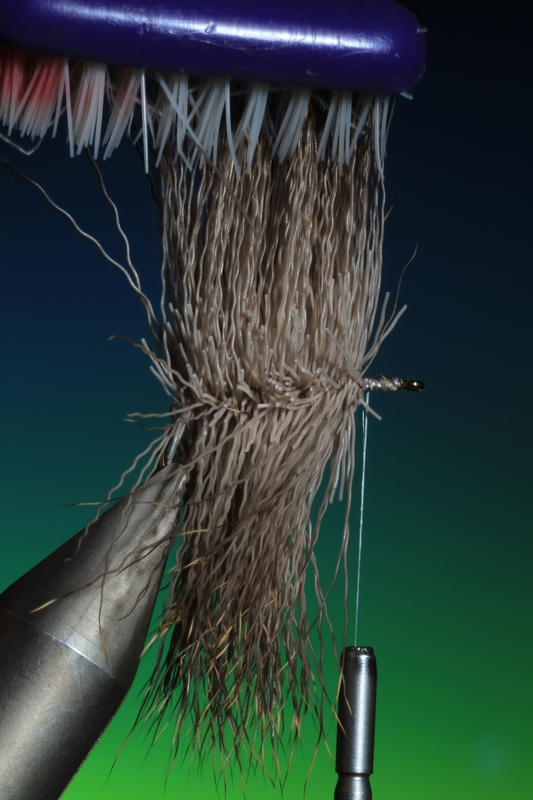 Take a lighter and singe the trimmed deer hair head. 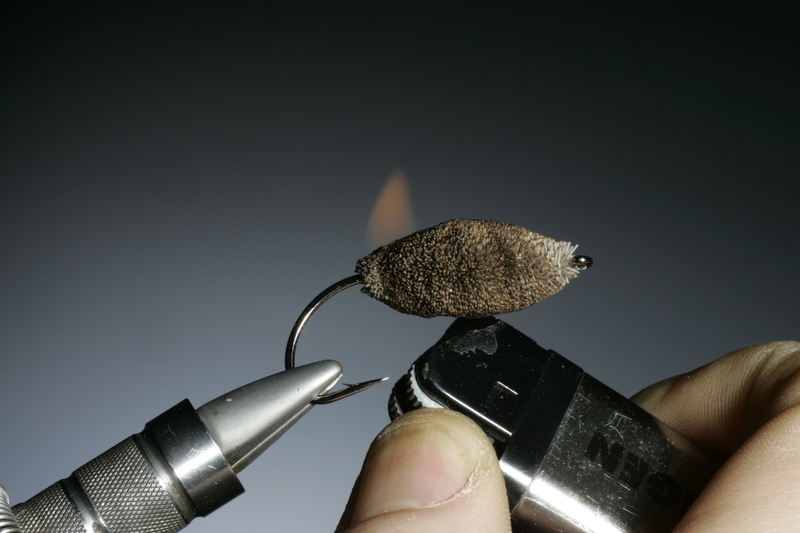 Take care not to set the whole fly on fire! 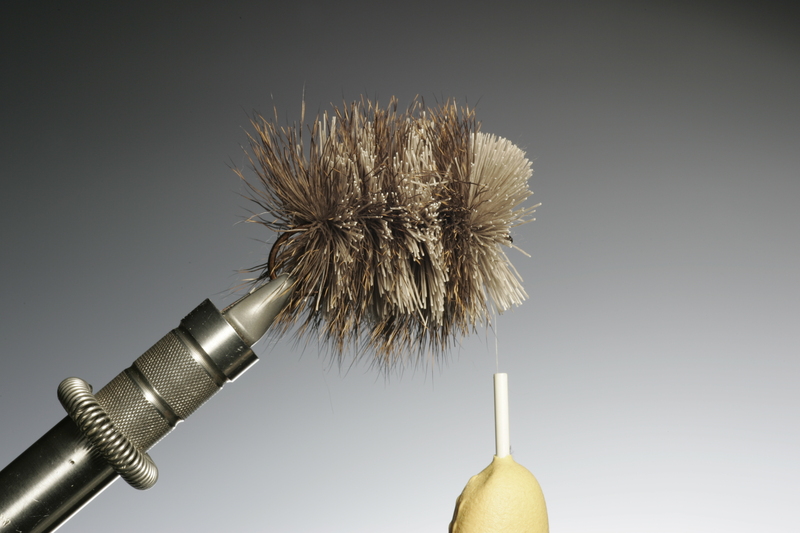 Once the head is singed give it another brush with the tooth brush to remove the soot. 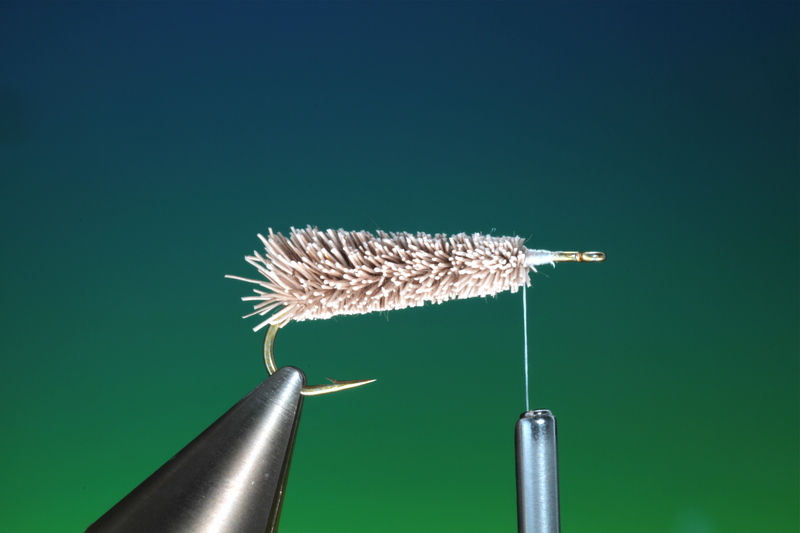 And there you have it , the Anglo Swedish caddis. Making a deer hair dubbing loop. 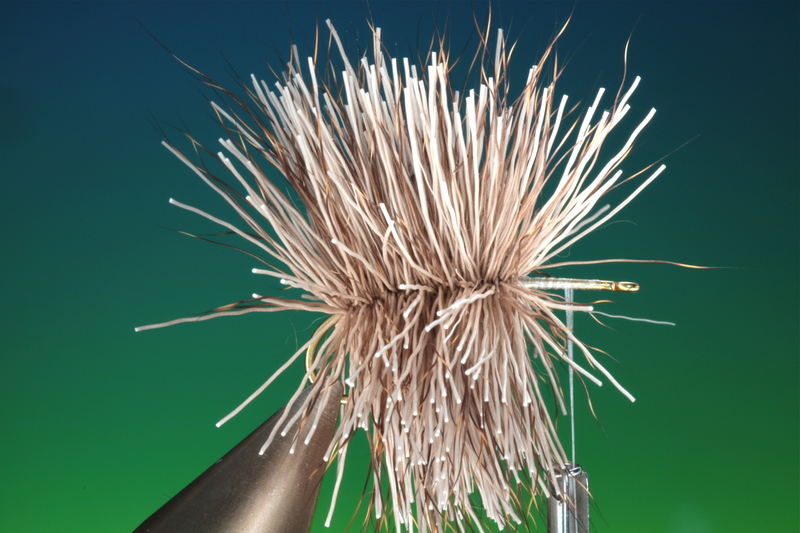 Recently I have had many questions regarding spinning deer hair and the best method of attaining a even open fibered body for deer hair flies. 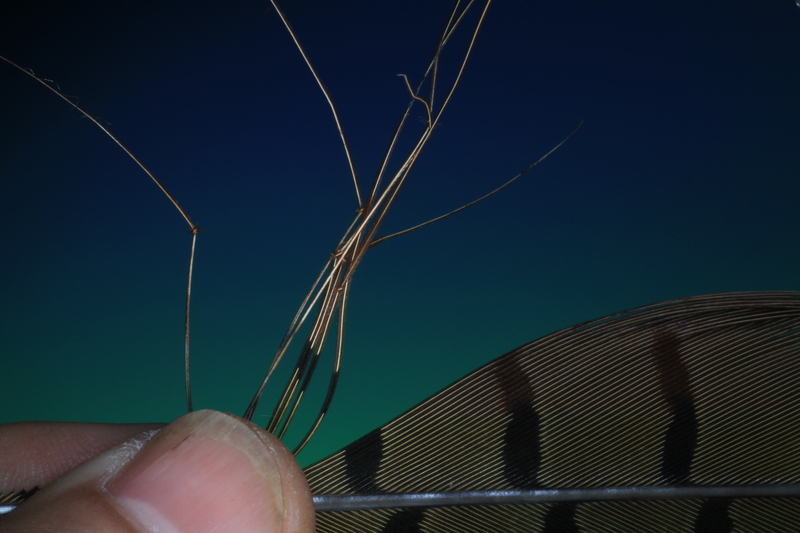 I use this technique on patterns such as G&H Sedge. The other technique is for making cork like bodies from deer hair. Once mastered these techniques can be applied to many patterns. 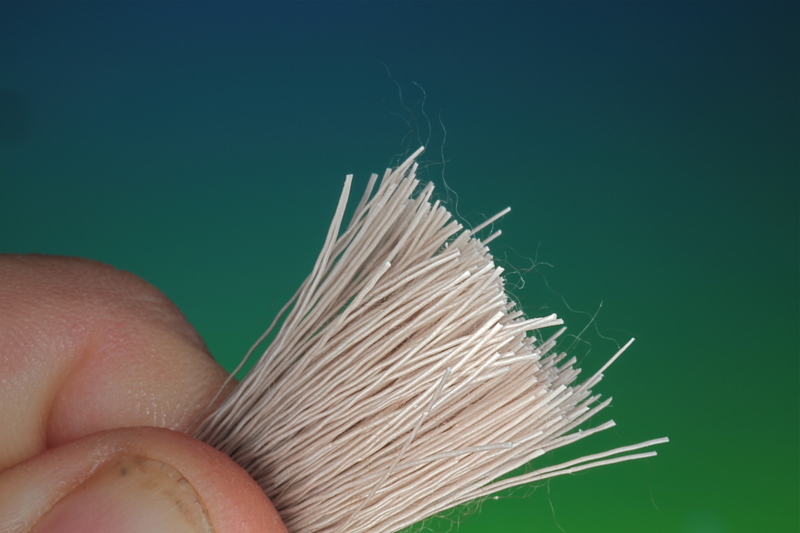 The material used here is deer hair, select your material and prepare it so that all the fibers are straight. 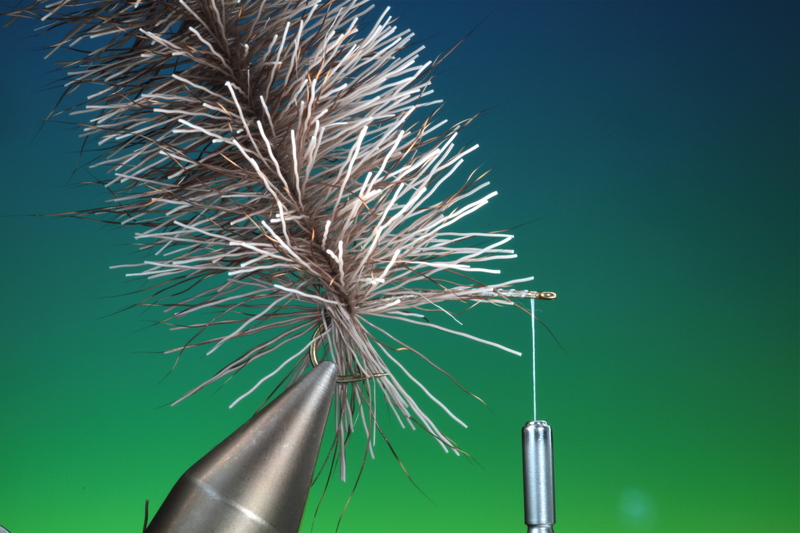 Attach your paper clip to the tips of the fibers. You determine the length of the fibre you would like at this stage. Carefully cut along the edge of the clip leaving only a couple of mm in front of the jaws. If you have more than this you will find that the spinning will be difficult and the material will fall out when used. Make a loop of tying thread at the rear of the area to be dubbed. 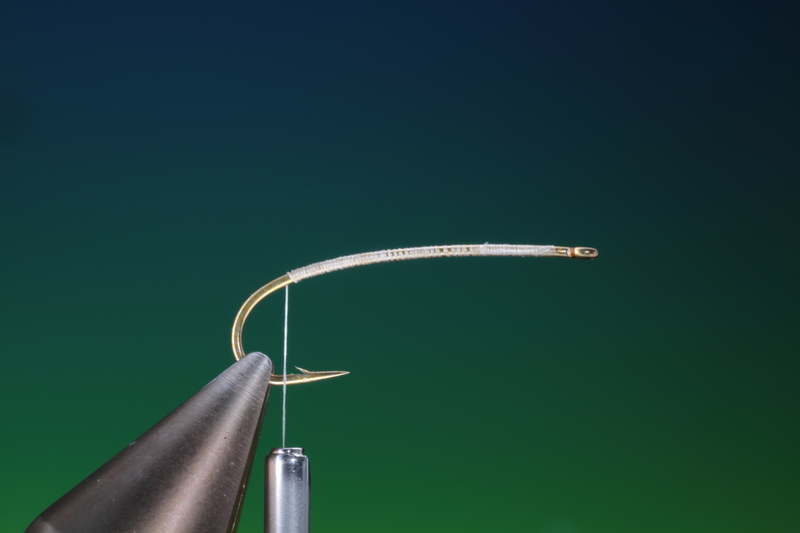 Be sure that the two strands of thread closest to the hook shank are tight together, ( Not open or the material placed between them will fall out ) this can be done by taking a turn or two of tying thread around the loop base pulling them together. Place the cut end of the material in between the two strands of the loop. 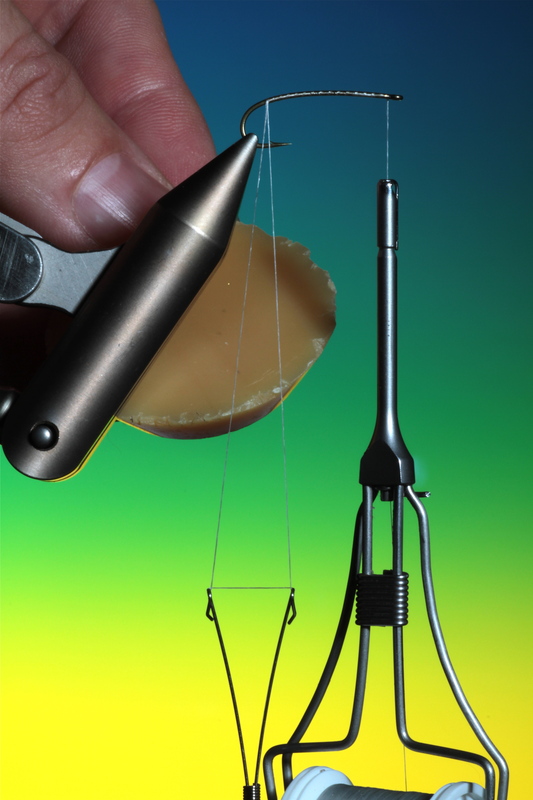 Now carefully open the jaws of the paper clip and remove it, letting the weight of the dubbing spinner hold the strands together trapping the material, and stopping it from falling out. Now you can carefully adjust the hair by sliding it up or down to distribute it evenly within the loop. 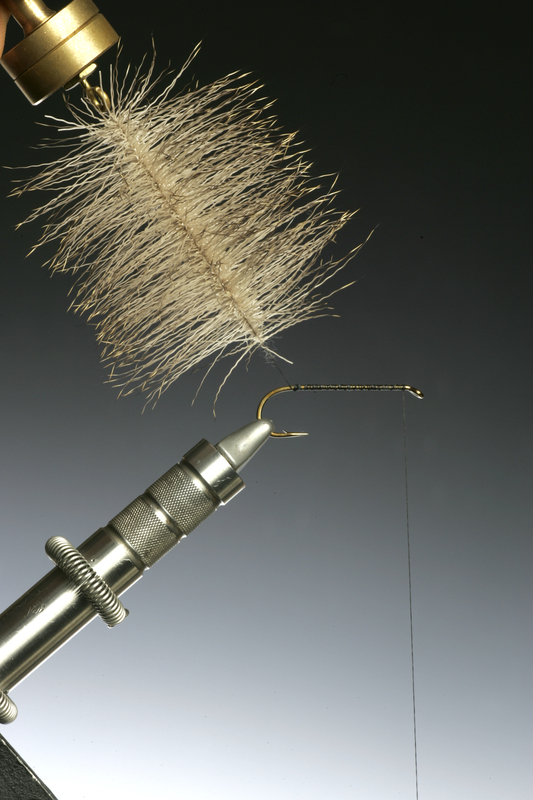 You can now begin to wind the dubbing onto the hook shank just like a conventional feather hackle, combing the fibers back with each turn. Repeat the process until the body is completed. For trimming the spun deer hair body, I find it best to use long straight serrated scissors for a more even finish. Start to trim the body on top of the hook shank from the rear and try and make each cut go the whole length of the body. The more even and singular each cut, the more even the body! 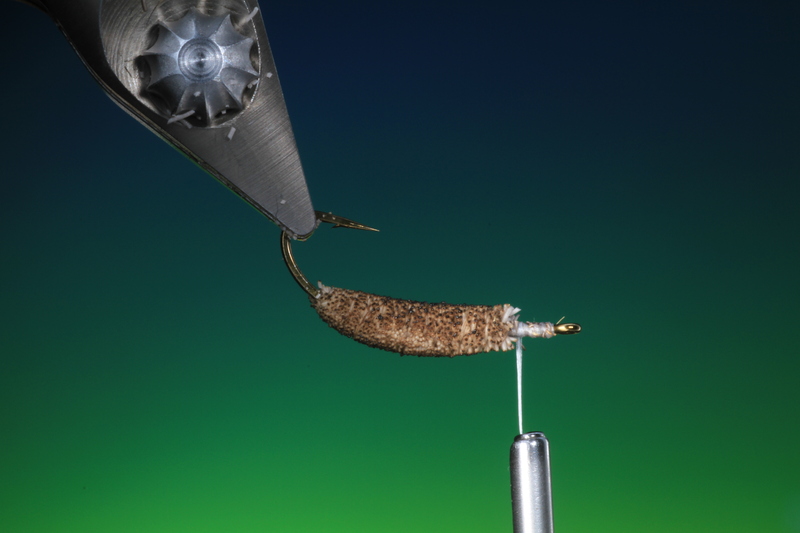 Continue trimming around the whole body of the fly until the required results are achieved. This is another technique if you would like a very tight spun body. 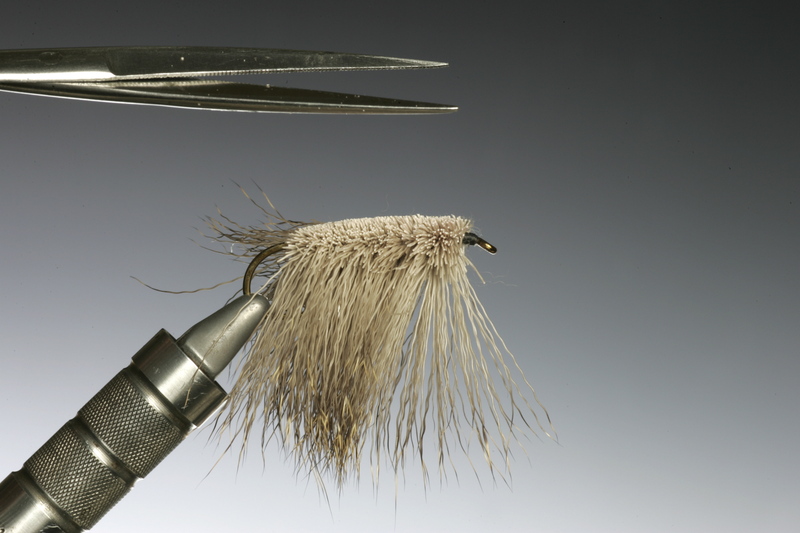 As you cover the hook shank with spun deer hair using a finger and thumb at the rear of the hair and at the front push and twist your right hand to pack the hair tight together. Trim your body roughly to the correct size. The result is a almost cork like body of perfect spun deer hair with a smooth even finish. That also floats like a cork!